The Solaro Tennis Club is a modern facility set on the hills surrounding San Remo (about one km away from the town centre), built in the 1970s in a modern Mediterranean style. The Tennis Club has hosted several important events, such as the Italian Tennis Championship in 1982, the Davis Cup, the Grand Prix Tournaments, the Under-14 Championships, and recently the training session of the Davis Cup Australian Team that later won the finals against France in Nice. The Solaro Tennis Club offers 9 tennis courts (with cement and natural earth courts), 3 of which are equipped with lights for night matches; 3 football fields; a swimming pool; a sauna; and a fitness centre where you can do body-building, aerobics, and cardio-gym. Here you can also find a parking area and a restaurant. 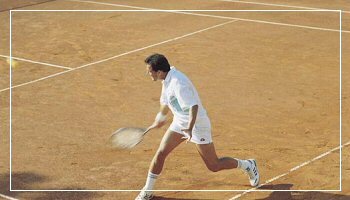 Thanks to its special weather conditions, you can play tennis outdoor all year round in San Remo – even during autumn when sunny days and mild temperatures are usually guaranteed. At the Solaro Tennis Club you have the option to train with an instructor or rent the tennis court for a relaxing match your own. Far away from the madding crowds but just a few steps from the busy town centre, the Tennis Club can be easily reached by public transportation and by car, and is easily accesible from the A10 “Autostrada dei Fiori” (Genoa-Ventimiglia motorway). A second facility dedicated to tennis, Club Matuzia, is located along Aurelia, in the Foce area.